…In this beautiful CD, Domenico Severin, with an overwhelming repertoire, highlights all of the voices of this majestic organ (also very beautiful to look at), of which we can appreciate all the nuances and tonal features, and which, from the very first notes, proves to be a worthy son of the prestigious Italian (but, for some time now, internationally famous) organbuilding firm of Fratelli Ruffatti. 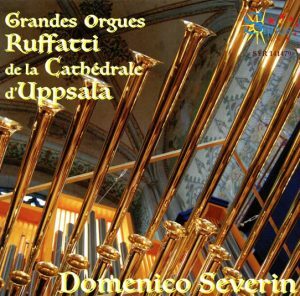 …..The instrument chosen by Severin for this recording is the prestigious and rather recent Ruffatti at Uppsala Cathedral. This organ follows the philosophy adopted by the Ruffatti firm during the last few decades and which has led this prestigious organbuilding firm to produce true masterpieces, especially abroad, and, specifically, in the United States, where its production is highly praised. The result of this tonal philosophy (which goes hand-in-hand with a very high level of manufacturing expertise) offers us instruments which are rich in registers of all kinds, which allow the performers to best express their abilities and to perform a repertoire which –- within the perspective of a post-eclectic organ — really ranges from the great classics to the contemporary composers. Many organ “purists” do not share this approach; while we believe that a Frescobaldi Toccata should preferably be played on a nice classical Italian instrument, at the same time we feel that hearing the perfectly voiced and balanced stops of an instrument such as the one in Uppsala is a real treat. …The tonal palette, with robust foundations, is rich in mutations, color stops of all kinds, clear and well-characterized mixtures, and singing reeds of great character. The “Tutti” is, obviously, majestically grandiose and has a splendid effect. The interpretation by Domenico Severin is – as always – very accurate and extraordinarily precise, always highly respectful of the nuances and character of the pieces. …To summarize, it is a CD which we liked a lot, which at times also excited us, and which we believe to be very interesting for everyone, due to the caliber of the performer, the beauty of the instrument, and the variety and quality of the repertoire. If you have friends and/or acquaintances who appreciate good music, this CD will be a perfect Christmas gift (but I recommend you keep a copy for yourself! ).